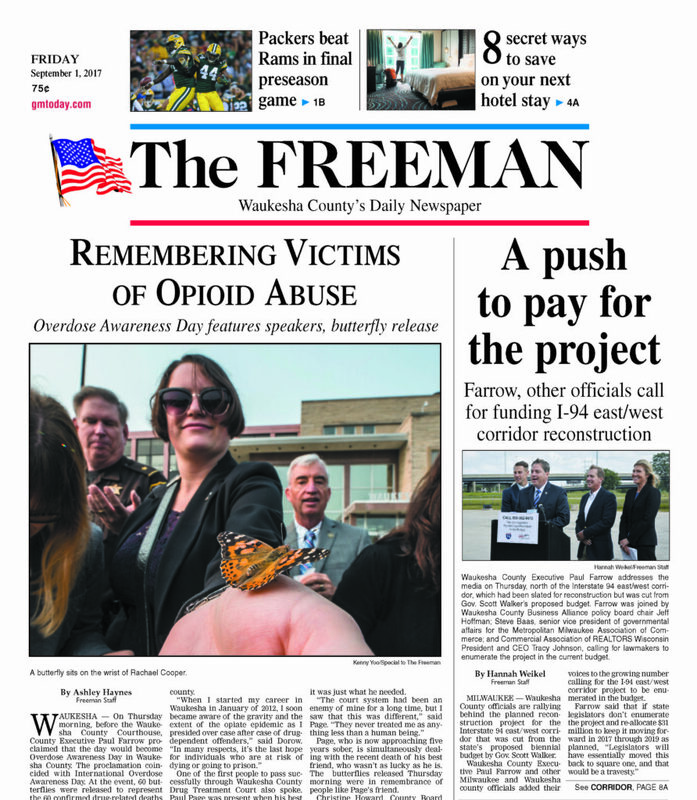 Waukesha Freeman — Waukesha County officials are rallying behind the planned reconstruction project for the Interstate 94 east/west corridor that was cut from the state’s proposed biennial budget by Gov. Scott Walker. Waukesha County Executive Paul Farrow and other Milwaukee and Waukesha county officials added their voices to the growing number calling for the I-94 east/west corridor project to be enumerated in the budget. Waukesha County Executive Paul Farrow addresses the media on Thursday, north of the Interstate 94 east/west corridor, which had been slated for reconstruction but was cut from Gov. Scott Walker’s proposed budget. Farrow was joined by Waukesha County Business Alliance policy board chair Jeff Hoffman; Steve Baas, senior vice president of governmental affairs for the Metropolitan Milwaukee Association of Commerce; and Commercial Association of REALTORS Wisconsin President and CEO Tracy Johnson, calling for lawmakers to enumerate the project in the current budget. Walker’s proposed budget would drop plans to rebuild the 3.5-mile stretch of I-94 between 16th and 70th streets, instead freeing millions for ongoing work at the Marquette and Zoo interchanges. But critics say the delay would “essentially squander the state’s investments in the Marquette and Zoo interchange projects” by leaving the I-94 east/west corridor in its deteriorated and congested state, according to a press release from I-94 East-West Econ Connect, a group calling for lawmakers to keep the project’s funding on track. Farrow addressed the issue publicly on Thursday afternoon in a parking lot just north of Miller Park, along the stretch of I-94 that he called critical to the state’s commerce. Jeff Hoffman, Waukesha County Business Alliance policy board chair, said the I94 corridor is the most important piece of roadway for commerce in the entire state. “We are asking that the legislature try to find a way to enumerate this key project in our current budget so we can continue to have the sustainable, modern infrastructure system,” Hoffman said. State Rep. Joe Sanfelippo, R-New Berlin, is trying to do just that with a pair of budget resolutions that would set a $15 surcharge on all moving traffic tickets and charge a $28 fee for reinstate drivers licenses. The state’s Joint Finance Committee will take up the state budget after Labor Day, including Sanfelippo’s resolution that would create $30 million in revenues to put toward projects like the I-94 east/west corridor. Approximately $20 million has already been spent on engineering, planning and an environmental impact study for the project. Critics of the delay say that taxpayer expense would be in vain. “If we go back to square one, that’s $20 million we might as well have lit on fire,” said Steve Baas, senior vice president of governmental affairs for the Metropolitan Milwaukee Association of Commerce. Baas said without reconstruction, the roadway will need repaving in 2020 that will cost up to $60 million, close lanes for one or two years and act as a “Band-Aid” for the underlying structural and design problems.